ELECTION ’12//ALCO SUPERVISOR DIST 2 | The Sacramento Political Action Committee with it sights set on thwarting Assemblywoman Mary Hayashi’s smooth sailing campaign for Alameda County supervisor has a rather comical and viciously biting name, but no money, as of yet. The group, using the short name, Morals PAC, according to a story today in the San Francisco Chronicle officially calls itself, “Hayashi for Alameda [County] Supervisor 2012, Morals PAC: Masses organizing research against lying & stealing opposing Mary,” according to the Secretary of State’s campaign finance database. One of the group’s leaders told Matier & Ross to expect a large mailer attacking Hayashi’s October 2011 shoplifting charge. 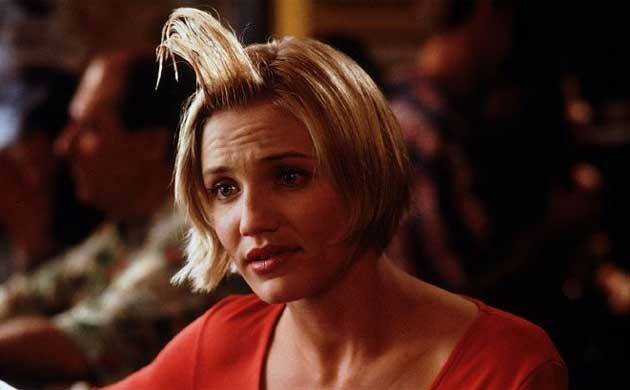 The campaign mailer, according to the Chronicle, is a riff on the famous movie poster of Cameron Diaz in “There’s Something About Mary.” But, according to campaign finance reports, Morals PAC has yet to file any transactions, including any designated as late contributions through Monday, Oct. 29. Expect the forthcoming piece to be wickedly satirical. The same group has lampooned Hayashi in the past with a series of comics. However, time is running out for any strong push by opponents to highlight Hayashi’s infamous brush with the law. In the meantime, some very vocal supporters for appointed Supervisor Richard Valle are still clamoring for him to drop Hayashi’s brutal mugshot on unsuspecting District 2 voters. With nearly a week to go, it is increasingly more likely this won’t happen, not only from Valle’s campaign or any other independent rival of Hayashi. Posted in Alameda County Board, mailers, Mary Hayashi, Morals PAC, Richard Valle, San Francisco Chronicle, shoplifting. Bookmark the permalink. I would suspect that this organization will come up with the money to put out the mailer. Now, on a lighter note, unknown to many, Mary has been putting out almost daily press releases on something called the PRWeb. —Assemblywoman Mary Hayashi Urges High School Athletes to Stop Smoking Cigarettes and Instead to Promote Responsible Use of Chewing Tobacco As A Substitute. This “Morals PAC” wants to allow physical therapists to be able to treat people in car accidents without seeing a medical doctor first. Most physical therapists have only a bachelor's degree. Hayashi voted against them to protect consumers! That's leadership and now they are attacking her for it. I think they could use some morals! Mary's my lil' ho! Buy, Buy Valle!! It's all in duh bag!!!!! 7:50 AM, You have presented a entirely misleading picture of what the fight is about in Sacramento. As usual its all about money. Doctors are trying to create a closed loop where all their patients are sent from them to their “doctor owned” physical therapy companies, much like when doctors own the MRI imaging centers. That way they get a cut everytime they send someone for a MRI. In fact that type of arrangement makes for more and more unneeded MRI's being taken. As much as 40% more done than at Non-Doctor Owned imaging centers. The same deal is happening to physical therapy. Doctors are trying to cut out all the non-doctor owned physical therapy centers which have previously made up most of the business. The entire plan that Hayashi is pushing is trying to grab more money away from physical therapist and forcing patients to only go to those physical therapy centers that are owned by the doctors. That is why Mary is getting the huge contributions from certain parts of the medical establishment. Mary plays hardball, you give her huge money and she is more than happy to cut out your competition. This group that is complaining if fighting for their life, to keep their services as they have been for decades. A turf battle that has little to do with quality of care and has everthing to do with MONEY. Mary Hayashi didn't get a war chest of $850,000 by simply representing the best interests of the people. Wake up and learn about it. There once were two crooks in the county. While Mary swiped rags, Valle did bags. Both were corrupt and their campaigns abrupt. Each told their lies while giving winks of their eyes. With both on the run, in the end there could be but one. So while Mary stole on her own time, Valle was on the county dime. We urge both to come clean, though we'll vote for clean Mark Green! Nice spin 10:34 – it's all about forcing patients to go outside of their doctors care and allow physical therapists to treat patients without first seeing a medical doctor. That's crazy since most PT are not doctors and have been trained to spot conditions not related to te PT world. You currently have every right to be a private physical therapist – but why does every PT have do be a small business owner – some would like to work for a hospital or medical group. Your plan doesn't allow that! Hayashi has just one vote – your objective is flawed and doesn't protect consumers. Get real! If I'm hurt in a car accident – I want a medical doctor to say I'm okay to start physical therapy. But in either case, we find Mary Hayashi with her hand out, making darn sure her campaign coffers are filled to the brim, for all her future ambitions. Too bad she shot herself in the foot stealing merchandise from Neiman Marcus. How about you explain why she continues to go about telling the press, and the people that she never intended to steal the goods. She continues to distort and lie. As District Attorney Gascon pointed out on KGO radio, that he had more than ample evidence to prove that Mary Hayashi with full intention stole the merchandise. Still she runs around telling everyone she fully intended to pay for the merchandise. NO, she planned the crime, she brought the extra Neiman Marcus bag with her to the store, then used it to conceal the goods. She is a deliberate thief. They had video tape, they had a witness. She was FULLY guilty. Now won't even answer a single question about her crime. She spent over a minute with a reporter saying over and over and over, “I'm not gonna talk about it” that she won't discuss or explain the damning details which prove her guilt, planning and intention in her crime. Do you want such a person as your Supervisor? Hayashi fights the good fight and is a true progressive! PTs couldn't get a majority vote – plain and simple because if they want to be a medical doctor and conduct business as a medical doctor then go to medical school for 4 years and a residency program for an additional 3 years. This isn't a third world country! Get over yourself – you're a PT not an MD! Oh yeah, and I love her discription of her shoplifting $2,450 worth of merchandise…. I HONESTLY robbed that bank your Honor, OK? Sure I planned it, and carried it out, but it was all a HONEST mistake. In case you haven't seen the latest mailer about Mary Hayashi, here it is. Nice photo of Mary they “borrowed” from her own website. That's the worst hit piece I have ever seen – it actually proves her point. When you use a news source – use one that has the facts correct – if you read the police report – it occurred on a Sunday not Tuesday. This is why the PTs aren't qualified to be political consultants or MDs! Idiots! You can be assured that when that mailer goes out to 60,000 houses, that at least 4 readers will see the same error you pointed out. That would be you, Mary and her husband Dennis, and hmmm…I thinking, but I'm sure one other voter will see the flaw. Keep sharp, they won't sneak one by you. I'm surprised they didn't use the mug shot of Mary on the mailer. Does anybody else think the repeated use of headlines and quotes from the LA Times is kind of odd in the “There's Something About Mary” piece? I don't get the premise that she's even famous in LA. Agree, not the best mailer, nor the best use of possible quotes and such from the LA Times. However, given the paucity of negative mailers and the lack of negative attacks on Mary over the past 60 days, this is pretty good. More importantly the mailer was the “reason” for all the free exposure gained by having the Chronicle, the Tribune, the Daily Review, the Argus, the Mercury News, Sacramento Bee, and such cover the important points mentioned in the mailer and also reminding the reader about other points mentioned in articles from earlier this month. When appearing in newspapers these points are given more weight. The newpapers had gone a bit light in the past month prior to the last 7 days. Given the high profile mess Mary had put herself into, she had skated by most of September and October…say, compared to Pete Stark. It is still astounding that a convicted shoplifter, with the original charges being felony grand theft, is even running. She has yet to really be nailed on her clear distortion of her “intention” regarding her crime. She has never diverted from her false story that the act was all “unintentional”. Clearly last week, San Francisco District Attorney George Gascon fully contradicted the notion that Mary was merely caught up in a “absentminded error” while being distracted on her cell phone. NO, Mary planned the crime, brought the extra Neiman Marcus shopping bag with her to that dressing room, then proceeded to conceal the merchandise in that very bag, before leaving the store without paying for the goods. She was guilty from A to Z, and would have been destroyed had she gone to trial. She is a criminal for unknown psychological reasons. Still trying to fool the voters and those around her by telling them it was all just a “honest mistake”. It will be a black mark on Alameda County politics if she is able to gain election to this new office in light of all that has been shown about her lack of scruples. Clearly if she wins, she will be running for State Senate in 2014 and will once again be playing Sacramento special interests for all they're worth. It will be close. Hopefully, though late, there will be more than one “hit mailer”. We'll see if this PT guy has the bucks to back up his bravado. The mailer probably has come too late. alot of folks have become inundated with all kinds of mailers from different campaigns. It's all going to the recycling bin at this point. Too late Valle! way too late! Supervisor Hayashi it will be! I want Mary to win if for no other reason so that District 2 will have a non-incumbent in two years. Gone will be two crooks and two light-weights. This will allow either Gail Steele to return, Ana Apodaca to take her rightful place, or allow a new and clean individual to come forth and reclaim the Second District for years to come. Suffering Mary in the short term is like taking bad medicine and being well in the end. Let's all vote for her only so we can pass her off in two years and reclaim District 2! This is the best option of ALL the bad options. 1:32 am – Has an infatuation with Hayashi that borders on the need for treatment – Seriously! This “morals PAC” has no money reported as of today. Even if they got the money – by the time it takes to print 60,000 pieces and mail it – it will arrive after the election. It's all BS that the media bought. Supervisor Hayashi it will be! Besides – her mail has been outstanding – has anyone seen a Valle piece mailed this week? Green? 12:31, Yes lots of borderline madness going on here in the last few days. All those mental disorders should resolve themselves by next Wednesday. ON the issue of “MORALS PAC” mailers. Time will tell. I would hope that anyone who has received one of their mailers would report it here ASAP. If they don't mail out any, then they have really scored a coup, because they got a ton of publicity in many newspapers. All the main points were in the newspapers, even links to sites showing the purported mailer. Next Monday, there should be a thread here where all the “experts” make their best guess on the percentage each candidate will get. 12:50 – so true! However – no one reads the newspapers anymore – they're all bankrupt! It will have little to no effect on the race. There will be a lot of Dem insiders scratching their heads on Tuesday night. Mary will be our next supervisor, leave in two years time and then we can start fresh in 2014 without any damaged goods. Life will go on; I promise you. This is her race to lose, which she won't. Start packing, Lockyer, er, Valle staff. Please, don't steal anymore county property on your way out of the building! If anyone wants to reach Chris Miley after the vote is certified, he'll be right across the hall, doing something for pa while getting those county $$$! I don't live in District 2, but I got 12 mailers in the box today. Takes a powerfull mailer to cut throught that barrage. if mary wins, is there any action the board can take to not allow her to be seated? 3:37 – when you lose an election – you lose. No do-overs, no “I don't like her” crap. The voters spoke in a democratic fashion – it's the will of the people. Hayashi is qualified to run and qualified to be seated. That's why we have an election – the person you want doesn't always win. Grow-up! Please support your claim with proof…website links, financial disclosures, etc. You are not stating opinion, you are stating fact…so please support it…don't worry…everyone on this blog already knows you're lying…no different then what Mary would do!! The Moral PAC is focused on the moral and ethical behavior of political candidates and/or officials seeking re-election. Then they need to focus on Valle, too. Hayashi's scandalous deeds are already well-known. Valle's misuse of taxpayer money and his office must see daylight as well. Kind of puts a shadow on Mary's white pearl necklace and Chanel accessories. You say grassroots – I say it looks like someone with mental health issues made it. About as effective as those sign twirlers trying to sell you a cheap pizza! Ha, yet both you and I know that those pizza places wouldn't be paying a guy to stand out there day after day if it wasn't working to bring in more business. That they still do that all over the place indicates it works. Look, the sign itself is totally unprofessional, but seeing it in the media boosts its appeal. I guess if you're into cheap pizza – then vote for Valle. Maybe he'll place it in one of those swag bags that taxpayers paid for! Now we just need to pin a frame of swag bags with the message “Another politician breaks law by spending taxpayer $$$$ on his campaign,” and we'll have a full narrative!